‘Fossil’ is hot favorite and makes affordable trendy watches. Its new Cross-Digital unisex orange watch is pretty cool with the silicon strap designed by Philippe Starck. 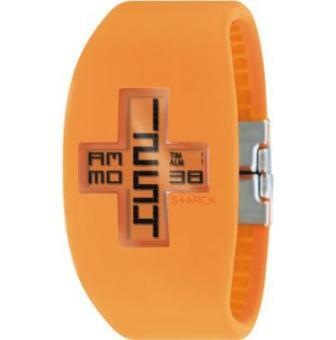 The Cross-Digi watch comes in hot orange, white, and green for $125. The watch displays cross digital inventive time and date display, with great hidden-functioning buttons. The Time is read vertically on downward position, and date and day information on horizontal display in 36mm x 48mm x10mm adjustable orange silicone strap. I feel, the Cross-Digi orange is worth your money and is a cool casual watch.